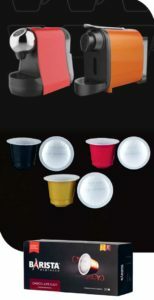 We are delighted to be launching exclusively in the Philippines the new PODiSTA range of Nespresso-compatible capsules!! 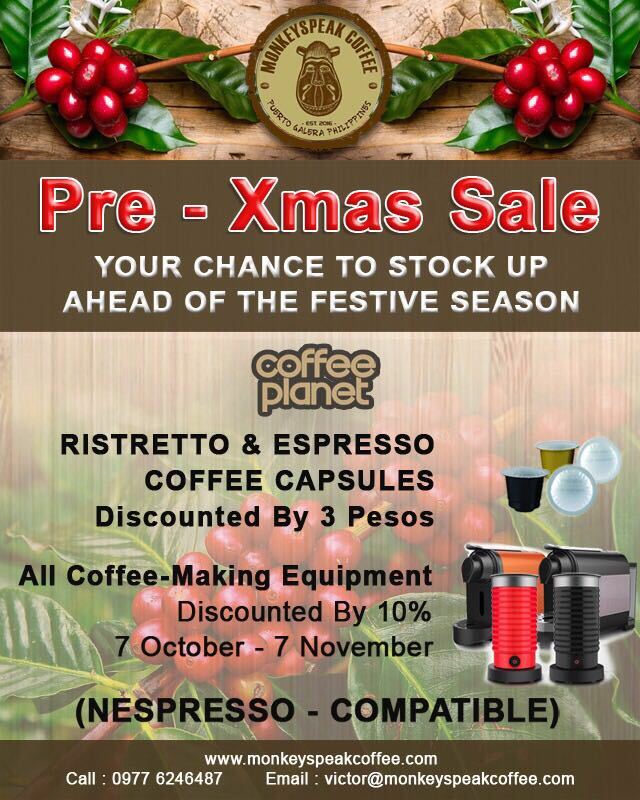 That's 5 additional varieties of Arabica/Robusta blended premium coffees and 2 additional varieties of hot chocolate drinks - alongside the exceptional Coffee Planet 100% Arabica range and Barista Choc Shots. Consumers now have a range of 9 coffees and 3 chocolate drinks to choose from. That's something for everybody! 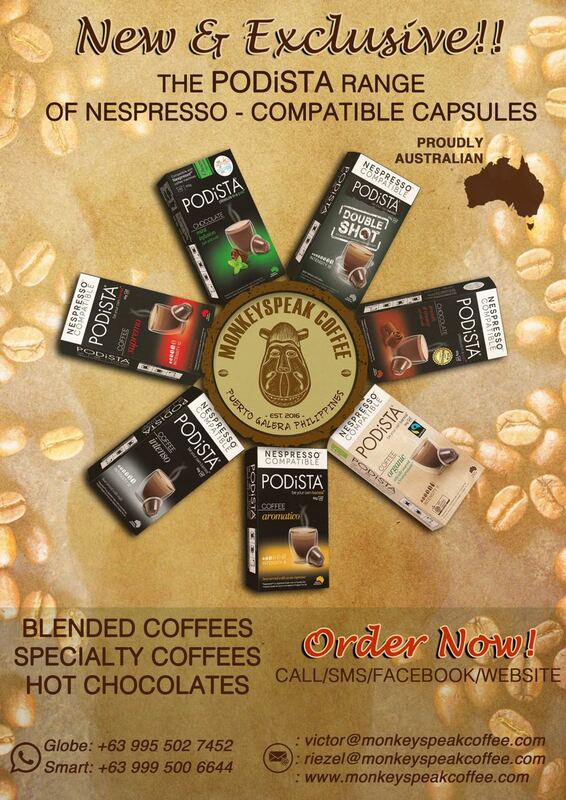 PODiSTA is proudly Australian, bringing premium coffee beans from around the world, then roasting, grinding and packaging in Australia adhering to the strictest of quality standards. The coffees vary in intensity and roast strength, and include the ORGANIC coffee option and the DOUBLE SHOT, with twice the caffeine plus Guarana extract to give anyone a real boost. The chocolate drinks are exquisite - the Mint Infusion Hot Chocolate fast becoming everyone's favourite! This exciting range of capsules is available in packs of 10 so you can order a variety and try any and all. We have rushed a limited edition release to be here in time for Christmas - order your now!!" With pure 100 percent Arabica beans sourced from the best specialty coffee growers around the world, Monkeyspeak offers the richest and most flavorful brews. Monkeyspeak also highlights the Philippines’ Arabica and Liberica (Barako) beans, which create smooth, strong, aromatic blends. Ensuring that you enjoy the perfect cup every time, Monkeyspeak also introduces its own line of coffee machines and electric milk frothers and steamers, which make brewing your own hot beverage a breeze. For a limited time you can try a variety of our premium coffee and chocolate (Nespresso - compatible) capsules by buying one or all of these assortment boxes!! We are delighted to release our new range of Coffee Machines and Milk Frothers. You now have a choice of the super-slim and sleek ELFIN or the slightly larger capacity Blazer. Both models utilize the Turando patented technology, designed for Nespresso-compatible capsules and exclusive to Monkeyspeak Coffee. Please visit for further information and contact us to reserve your preferred choice today. At the same time we have added the modern Aeroccino IV (choice of black or red) to the classic Espressi Milk Frother. Both models are exclusive to Monkeyspeak Coffee. Monkeyspeak Coffee Introduce Chocolate Shot Capsules! We are extremely excited to introduce the Chocolate Shot – a capsule-based speciality drink giving you a shot of rich, smooth chocolate. Perfect for enjoying on its own, as the base for a traditional hot chocolate, poured over ice cream or mixed with a shot of espresso for a decadent café mocha. The Chocolate Shot is not a flavoured coffee, its pure chocolate. Something for the whole family and a perfect new item for your restaurant or bar. Please visit for more information. And until the end of May boxes of 20 capsules are retailing for Php 550 instead of the Php 600!! We now carry Descale Magic as part of our goal to become the one-stop-shop for all our clients’ accessory and cleaning agent needs. Sooner or later every coffee machine will require the removal of built up scale. This should be performed at regular intervals with the frequency depending on the hardness levels of water used and how often the machine is in action. Please visit for more information.